Over the last two decades the Mime Festival have tracked almost the whole of French director Aurélien Bory's career, starting with debut performance IJK (a piece in which Bory, himself a juggler, performed), staging the three pieces of his space trilogy, and, most recently, programming his incredible piece for two acrobats and industrial robot, Sans Objet. 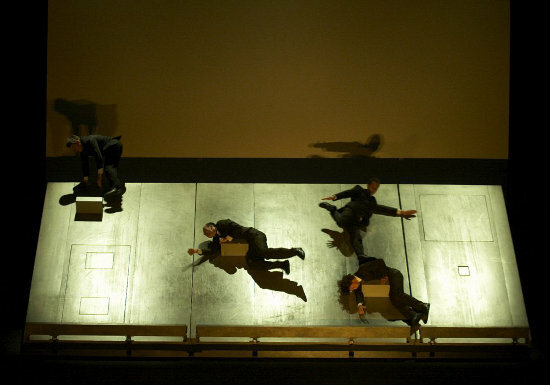 Plan B is a restaging of the first piece from the space trilogy, first performed in 2003, made in collaboration with Phil Soltanoff, and played against a tilting set with live feed projections by Pierre Rigal. It's widely acknowledged as an influential classic. For more on Compagnie 111 see Sideshow's interview with Aurélien Bory.